The Huawei Cyber Security Evaluation Centre (HCSEC) has a giant banner hanging outside declaring its purpose to the world. The hush-hush blueprint inspection facility is part-staffed by GCHQ spies, and probes the Chinese giant's networking products for vulnerabilities and any backdoors. Its location is only ever given as "Banbury, Oxfordshire" in England. But HCSEC HQ, which would otherwise have fitted The Guardian's description of it as "deceptively humdrum", has a great big banner draped over its main entrance of the sort you'd find hanging outside a pub. 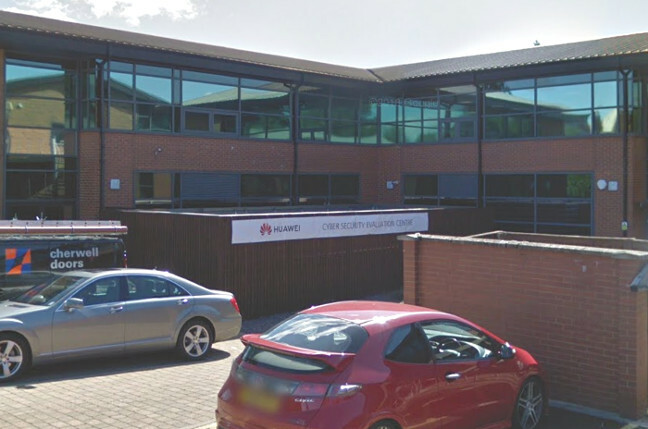 Spotted by the eagle-eyed Alan Turnbull of secret-bases.co.uk, the banner reads, simply: "Huawei Cyber Security Evaluation Centre". Ever the helpful chap, Alan also found it on (where else?) Google Street View. If you want to view it yourself and have a virtual drive around the Banbury Office Village, just click here. HCSEC rather breaks the mould of secretive British governmental functions advertising their presence – though as HCSEC is administratively part of Huawei, despite being part-staffed by people from eavesdropping agency GCHQ, this may not be such a big breach of protocol after all. The London office of GCHQ’s cuddly National Cyber Security Centre arm, named Nova South by the agency, has no external or even internal signs that it is a GCHQ outpost; lots of trendy (and not-so-trendy) Londoners walk past the building, opposite Victoria Station, every day without realising what's inside it.